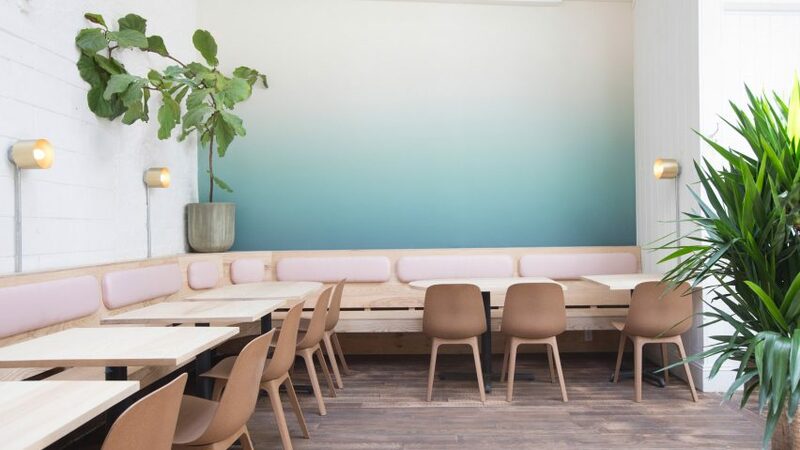 New York designer Huy Bui turned to studios and brands based in Brooklyn to create the verdant interiors for this Vietnamese restaurant in the borough's Greenpoint neighbourhood. Bui was responsible for the overall interior design and build for Di An Di, which translates as "let's go eat!". It worked with consultant Michael Yarinsky on the decor. The restaurant, which opened this month, was set up by owners Kim Hoang, Dennis Ngo and Tuan Bui – a trio of first-generation Vietnamese-Americans. The aim is to provide traditional cuisine in a contemporary setting that looks and feels appropriate for New York. "Di An Di transports us to the spirit of Dalat, a countryside north of Ho Chi Minh City, where city dwellers take refuge to the rolling hills and the lush landscapes," Bui told Dezeen. "The interior is meant to reflect the food and the culture of the restaurant itself – fresh, bright, transportive and driven by community," added Hoang. Greenpoint is an industrial neighbourhood north of Williamsburg that is growing increasingly trendy so, like many areas of Brooklyn, it is home to many design studio and brands. Bui therefore did not have to look far for materials and products to complete the space, which is divided into two main zones. In the bright dining area, brickwork is painted white and daylight floods in through skylights. Custom banquettes that line the walls were fabricated at A/D/O – a creative venue backed by car brand MINI that is located a few blocks away. "Kim had a vision of creating continuous banquette seating that weaves and connects the three sections of the restaurant together," said Bui. Feature walls are covered in gradients created by Calico Wallpaper, while light fixtures were designed by Ladies & Gentlemen Studio, both based in nearby Red Hook. Seat backs on the white and wood banquettes are coloured sage green and pale pink respectively, complementing the distressed timber flooring and wide variety of plants across the restaurant. The bar area has a much more intimate feel, thanks to the darker shades used. Surfaces are coloured in a much deeper green, matching wall coverings printed with palm and monstera leaves from Brooklyn-based Flavor Paper. Copper pipes form frames for shelving, light fixtures and trims around the bar. Wooden chairs and stools complete the interior, while a neon sign by New York artist Nastia Kobza hangs in the street-facing window. "The desire for simplicity, and timeless materials led us to wood, brass, and copper, and of course our beloved plants and shades of green painted throughout," said Bui. Brooklyn is brimming with places to eat and drink. Recently opened options include the Gowanus Inn and Yard hotel designed by Savvy Studio, and the Devoción coffee house by LOT.